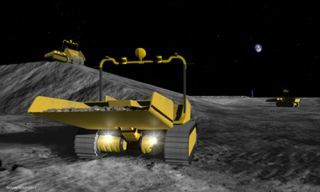 Lunar bulldozer robots may perform sitepreparation for moonbases.A NASA-sponsored study, prepared by Astrobotic Technology Inc. with technicalassistance from Carnegie Mellon University?s Robotics Institute, was presentedlast Friday at a NASA Lunar Surface Systems conference. ?NASA faces a challenge in planning the layout for itsoutpost, which is expected to begin operations in 2020,? said Dr. William ?Red?Whittaker, chairman and chief technical officer of Astrobotic and a CarnegieMellon professor of robotics. ?For efficient cargo transfer, the landing siteneeds to be close to the outpost?s crew quarters and laboratories. Each rocketlanding and takeoff, however, will accelerate lunar grit outwards from the pad.With no atmosphere to slow it down, the dry soil would sandblast the outpost.? Two potential solutions to the problem were examined: 1)creation of a berm around the landing site and 2) creation of a hard-surfacelanding pad using lunar materials. Utilizing the second of the two alternatives mentionedabove requires that the small robots comb the lunar surface for rocks,gathering them for a durable grit-free landing space. The robotic lunar bulldozers would not be operated byastronauts; instead, the robotic 'dozers would be directed by a combination ofdirect teleoperation and supervised autonomy by workers on Earth. 'But then,' Lunan said, 'not every bulldozer operatorworks on the Moon.' The cameras followed the trim woman into another room,where there was a replica of a large tractor. It was surrounded by TV screens.One screen showed an astronaut sitting in the driver's seat, staringimpatiently into the screen. A bleak, nearly colorless pit showed over his leftshoulder. 'About time you got here,' the astronaut said. The bulldozer moved through the lunar strip mine..."
See also this video of the bulldozerattachment to the Lunar Chariot; this is a multi-purpose vehicle intendedfor use by astronauts on the Moon. Read the previous article for moreinformation about it - NASA'sChariot Is Not Your Father's Moon Rover. From Carnegie Mellon University; see also this excellent Astrobiotic MoonDigger report (pdf) and this earlier reporton Lunar In-Situ Resource Utilization (pdf).